Another great open access week event at the University of Pittsburgh. Today Michael Carroll, Professor of Law and Director, Program on Information Justice and Intellectual Property, American University, Washington College of Law, gave a talk titled Open access policies: Coming attractions. He began by framing open access as information environmentalism. To illustrate this he told the story of how 30 years ago it was hard to recycle. People had to be committed environmentalists and make an effort to separate their trash and take it to often remote re-cycling stations. Today recycling waste is part of regular garbage collection process and practice. Just as, at the moment it is a little hard for researchers to make their work open access. Authors may have to amend copyright agreements with publishers, or add addenda to these agreements to retain their rights, or seek out open access journals, and/or deposit their work in repositories. But, he contends, we are in the middle of a historical shift. Soon, just like recycling in our home lives, open access in our research lives will become a matter of fact. The way around this is to make sure (by negotiation, publishing venue, publishing addenda and any other possible means) that scholarly work has a CC BY licence. There was much other good stuff in this talk: discussion on the emerging US OSTP policy which is framed around the idea that the public should be able to “read, download and analyse” publicly funded research, how authors can negotiate with publishers to retain some of their rights, new forms of journals, publishing and peer review, just for starters. A lively discussion followed , with questions and discussion on the related roles, places and infrastructures for data, as well as for the peer reviewed research, the possible economic possibilities and problems in this period of transition. In all, an interesting and stimulating presentation and discussion. 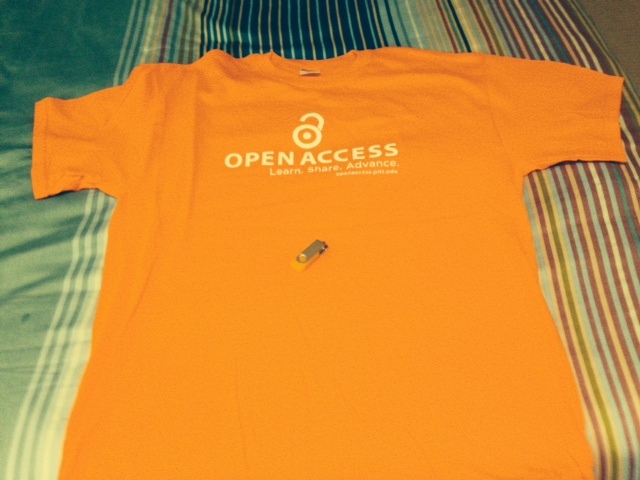 For quite some time I have hoped that open access is the way of the future. After this talk, I feel that OA is gaining impetus and strength, increasingly mobilising and translating the academic community into supporters and users.